Looking up email addresses in Canada is easier when you have a trusted database already prepared for you. This is one of our ready-made lists of emails, and is full of points of contact in the True North. Reach out to a new market with the help of our organized and reliable email lists. Canada is an important country to market to: While its population is low, its influence is high, containing many high-ranking professionals in numerous industries. With this Canada email database, email marketing is easier than ever. You can find the influential professionals ready to make business connections in important cities like Toronto, Montreal, Ottawa, and Calgary. Use our build-a-list tool to focus on a specific area of Canada; business databases from Bookyourdata.com can be customized to create a more targeted list. With our customization features, getting an accurate lead list is easy, whether you're hoping to sell to CEOs in Montreal or reach out to small businesses in Canadian markets, including the greater Toronto area. Customize your own list or simply download this pre-made Canada email list to get started right away. Our lists are human-verified, of a very high quality, cost-effective, and contain all the relevant information you need to really get the conversation going: email addresses, phone numbers, titles, postal addresses, and names. 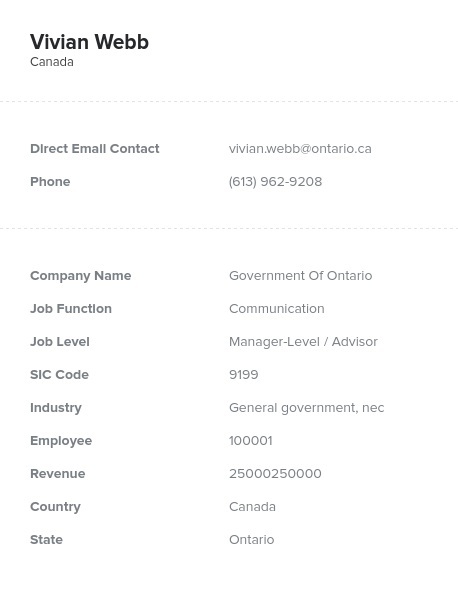 To make B2B connections across borders with email marketing, Canada contact information is needed. With us, you have a reliable solution that can allow you to reach across the kilometers and make deals in Canada. Mailing lists are ready for you to download and integrate within your CRM in minutes, so you can start connecting with new sales leads right away. Buy this ready-to-download and -integrate Canada mailing list from Bookyourdata.com to email leads today!